Toward the end of the 4th century BCE, new shapes and materials were introduced to Greek jewelry. The most ingenious innovation of the Greek goldsmiths of this period is the animal-head earring: a tapering, penannular hoop made of twisted wire with one terminal and the larger end in the form of an animal's head. In this example, each of the earrings is composed of an elaborate hoop of spirally twisted, corded wires that tapers toward one end, which terminates in a globular extension, while a large lion's head is attached to the other end. The hollow head is marked by a high-rising, curly mane and stylized, baroque features. In contrast, the collar covering the join is relatively plain: a circlet of spool wire, one of plain wire, a fringe of tongues embossed on a strip of sheet gold, and a border of fine beaded wire. 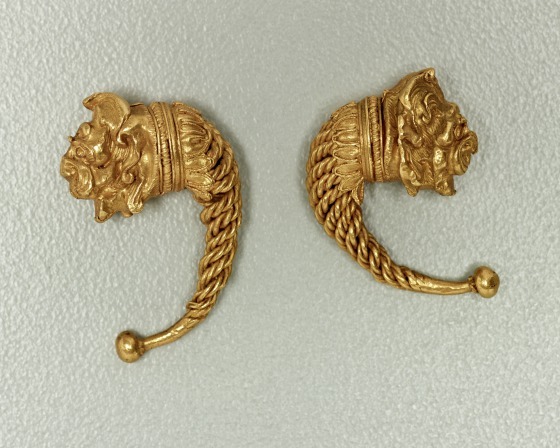 It has been assumed that this design derived from Etruscan lion-head earrings, represented by several examples seen in the collection of the Dallas Museum of Art (1991.75.27.a-b, 1991.75.28.a-b). 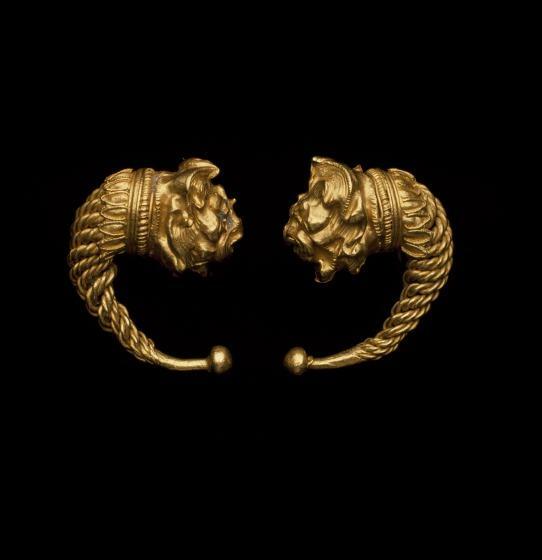 But besides the fact that there is a gap of nearly 200 years between the Etruscan and these late Classical to early Hellenistic lion-head earrings, the similarities are superficial. It is more likely that the animal-head earring is a genuine Greek creation, inspired by a long-established type of Greek animal-head bracelet, like this lion-head bracelet (1991.75.52), also in the collection of the DMA. Almost immediately after their introduction, animal-head earrings became the most popular type of ear ornament in the Greek world. The following two centuries saw a number of variations of the basic scheme. 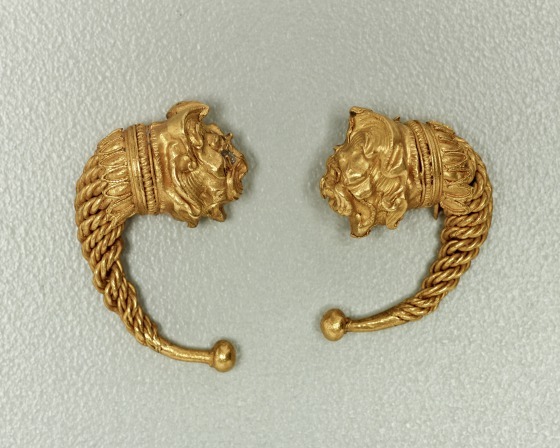 Compared to another pair of earrings, a standard version of the same type (1991.75.60.a-b), this pair represents the more flamboyant style of southern Italy where Greek goldsmiths developed variants of the basic concept marked by elaborate hoops and lions' heads with high-rising, fancy manes and ornate faces, as seen here. This example, along with several others in the DMA's collection (1991.75.63.a-b, 1991.75.62.a-b, 1991.75.64), are characteristic examples of this baroque style from Magna Graecia. Lions were popular subjects in Greek jewelry; they symbolized fertility and regal power.